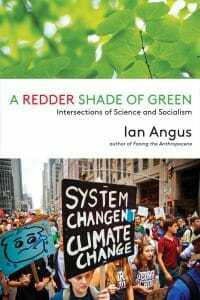 A Redder Shade of Green is a very welcome compilation of posts from Ian Angus’ website “Climate and Capitalism,” some original, others updated and revised. Ian Angus is a Canadian ecosocialist activist and scholar. This book follows two other earlier ones, the excellent critique of populationism/neoMalthusianism (with Simon Butler), Too Many People (Haymarket, 2011), and Facing the Anthropocene (Monthly Review Press, 2016), a splendid introduction to this subject. This book begins with an account of a little-known 19th-century chemist, Carl Shorlemmer, who was a close friend of Marx and Engels. Schorlemmer was a seminal figure in organic chemistry, and also a communist. As Angus emphasizes, Marx was in sync with Engels with regard to their keen interest in the natural and physical sciences; there was no division between them with respect to the relevance of materialist dialectics to these sciences, despite what is often claimed to the contrary, that Marx reserved dialectics to society. The following chapter describes the enthusiastic reception by Marx and Engels given to Darwin’s theory of evolution. Two assertions in this chapter merit comment. First, Angus discusses evolution before Darwin, mentioning Darwin’s grandfather Erasmus, and Lamarck. But there is another little-known figure who wrote on evolution by natural selection before Darwin (who, like Wallace, cited him): Patrick Matthew, a Scottish horticulturalist, who was also a catastrophist in a context which is very modern, stability punctuated by mass extinctions. In the same chapter Angus accepts uncritically Marx and Engels’ argument that the “ability to produce life’s needs distinguishes humans from other animals.” However, some species of ants, termites and beetles practice agriculture, raising fungi for their food! Part II, “Responding to the Anthropocene,” is right on target, with its incisive critique of the so-called ecomodernists, neoliberal boosters of nuclear power and natural gas (e.g., the Breakthrough Institute). Especially interesting is Angus’ critique of Jason Moore’s writings, with their confusing, shifting formulations. Angus argues that, contrary to Moore’s claims, Anthropocene science “explicitly denies that society and nature are separate entities” (72). Angus quotes approvingly IGBP’s 2004 report: “Human beings, their societies, are an integral component of the Earth System, and not an outside force perturbing an otherwise natural system. . . . They are often impossible to separate completely and they interact in complex and sometimes mutually reinforcing ways.” As a biogeochemist I fully appreciate the nonlinearity of society–nature interaction, but understanding these dynamics requires research that reveals the actual anthropogenic fluxes over time. (One example: carbon dioxide emitted by burning fossil fuels; the resultant enhanced greenhouse effect is a physical process, not a societal one.) Nevertheless, I applaud Angus’ support for the synthesis of “ecological Marxism” and Earth System Science. One caveat responding to the discussion on pp. 51–52: the long-term carbon cycle operates as a thermostatic regulator of climatic temperature on time scales on the order of several hundred thousand years, while climatic perturbations are very relevant on a much shorter time scale; hence, “Gaia” will not save humanity from dangerous climate change induced by anthropogenic fluxes of carbon dioxide, methane, nitrous oxide and other greenhouse gases to the atmosphere. More food for thought is found in later chapters, including a powerful critique of populationism/neoMalthusianism, which is developed at length in Angus’ book with Butler, Too Many People? Angus honors the seminal contributions of Barry Commoner, along with those of Rachel Carson and Murray Bookchin. I would add to this list the geochemist Claire Patterson for his discovery of the pervasive lead pollution of the biosphere, especially in urban areas, with the main source in the 20th century being the burning of leaded gasoline, a crime against humanity. This discovery was an unanticipated result of Patterson’s research on the age of the Earth in the 1950s, which required accurate measurement of lead isotopes in meteorites and crustal rocks. I particularly appreciated Angus’ dissection of the influential “overshoot” claims regarding human civilization (e.g., William Catton’s book Overshoot: The Ecological Basis of Revolutionary Change) with its subtext of overpopulation being the prime driver, most recently revived in a Guardian article account of a 2014 NASA study. Addressing farming and biodiversity in the “Third World” (who uses this term any more? Why not “Global South”? ), Angus reminds me of the outstanding contributions of the wife–husband ecology partnership of Yvette Perfecto and John Vandermeer, in particular their emphasis on the key role of small farmers and the landless in preserving and restoring biodiversity, coupled with their struggles for food sovereignty and sustainable agriculture. Similarly, Angus has an insightful critique of the 2012 book Catastrophism (Sasha Lilley, et al., PM Press, 2012), emphasizing that the struggle for climate/energy/environmental justice should share the knowledge of the ever-mounting threat of climate catastrophe. 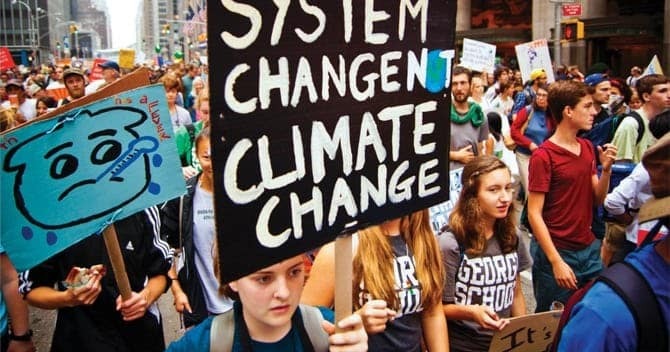 The book closes with a discussion of ecosocialism in theory and practice, in particular in relation to the climate justice movement. Angus gives welldeserved credit to the contributions of John Bellamy Foster, but unfortunately omits any mention of the importance of Joel Kovel’s writings, and his editorship of the journal Capitalism Nature Socialism, with its nearly 30-year publication history (Joel was preceded by James O’Connor and followed by the soil scientist Salvatore Engel-DiMauro, important contributors to ecosocialist theory likewise not mentioned). I suggest that Angus take his own criticism seriously, when he points out that mainstream demographers commonly fail to cite the sharp critiques of overpopulation explanations by Barry Commoner, e.g., The Closing Circle. I found Angus’ discussion of ecosocialist practice valuable, in particular his stress on creating broad movements. 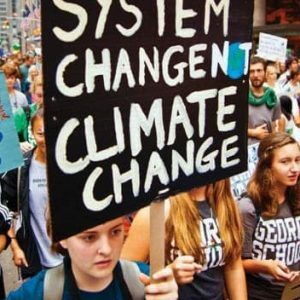 His strategic vision, however, is a bit vague; e.g., what about the Global Green New Deal as an opportunity for ecosocialist class struggle, within the context of the growing threat of catastrophic climate change? In closing, I welcomed the opportunity to write this review because I was able once again to appreciate the invaluable insights of Ian Angus and those his “Climate and Capitalism” website continues to provide.